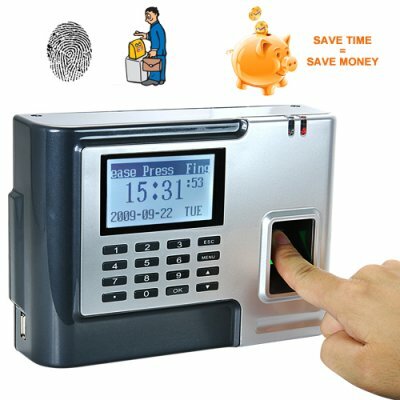 Successfully Added Fingerprint Time Attendance and Door System (Silver) to your Shopping Cart. This fingerprint time attendance device is perfect for company HR Managers of any small or medium sized business. This device will work wonders in making your job easier while also making it possible to more closely monitor employee time, thereby saving your company money and time. Do you know what Buddy Clocking is and how much it can cost your profitability? "Buddy- clocking" is when a co-worker clocks in or out for another employee. With text messaging and the widespread use of mobile phones, it is easy and convenient for an employee to text a co- worker and say "hey, can you clock in for me, I will 15 minutes late". Well, with a Biometric Fingerprint Time-Clock those days have come to an end! Now your company will be able to capture every minute of work you pay for! In stock in our warehouse right now, this is the perfect resale item to sell to your bigger clients or even install in your own office. Click "Add to Cart" now and we will express ship it out to you tomorrow. The CVKH-BG03 is exclusively available to you from the leaders in factory direct wholesale electronics, Chinavasion. Note (2): Your computer needs to be set to Beijing time in order for the software to function properly. Important Note for Hourly Employers: The cost of missed labor hours can be very high. Studies have shown that if you have 20 employees receiving pay for merely 4 minutes of "wasted" time per day (coming in late, leaving early, extended lunches, etc. ), that will total 1600 minutes per month. If your average pay rate is $12.00 per hour, then you pay an extra $320 each month for work that was never done. Add in an estimated employer contribution on government benefits and other taxes, then your annual cost is above $5000 for that empty time. The solution to removing this lost time is Fingerprint clocking, its unique and cannot be shared among employees. Your computer needs to have its home city and date style to be Beijing style. You can set the date and time on your computer to your local time, but the computers home city and date format will need to be set to Beijing. The userid and password can be found in the user manual, but here is it anyway. Userid is "admin", no quotes needed. The password is either: 321, 123, 1234, 000, 0, 0000, 1, or just leave it blank.